Here’s a quick update from agentorangeguy. I’ve been doing a lot of map work lately, cleaning up areas and polishing them up. The only “rough” areas left are a few islands near Serpents’ Hold, Isle of the Avatar, and possibly a few small areas on the mainland. Structure wise, the only part left to build on the main map is the Isle of the Avatar and Stonegate castle. Finally, the main map is near complete! 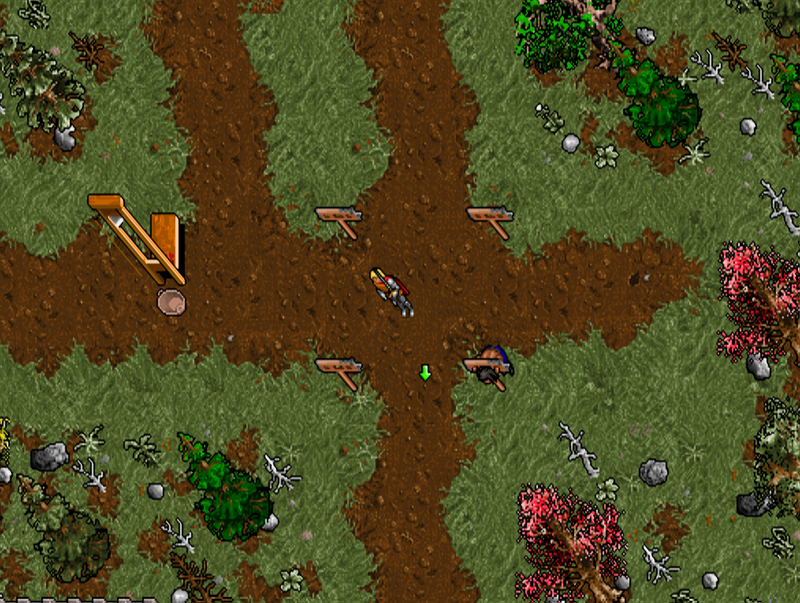 From there, the npcs will be finished on the main map. The towns left needing full npc conversations are Moonglow, New Magincia, and half of Serpent’s Hold. Some of the wanderers/loners will need to be fixed as well. Many npcs need touched-up portraits by Odkin still, but in the meantime, I am using the original portraits on those. We’re still in need of custom in game books. If we receive at least 10 eligible in-game book submissions, we will release an area of the map for a demo. There will probably be a poll to determine which areas are released, so keep checking back for updates and send in your book submissions! Buccaneer’s Den is finished with all NPC’s functioning correctly with conversations, and just needs updated portraits. The late night brawling will be added soon as with Jhelom. 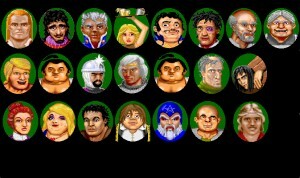 Minoc is finished with NPCs (they just need portraits) with the exception of the lady who makes the balloon.. Serpents Hold npcs are almost finished. Crowley has been working on various new shapes, concentrating on completing the giant ant, a new look for Blaine, and other things. The balloon will probably be the next big thing to tackle, but it is still in planning stages. 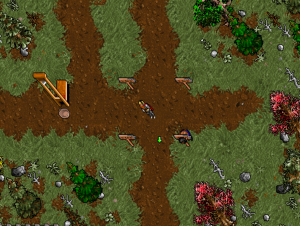 Also, there has been some random touching up of areas on the map. Most of the map is complete and just needs touching up. -Map work is coming along well, the desert area has been finished. Crowley is working on the ant mound entrances, making them actually resemble ‘mounds’ instead of holes in the ground. Also, he is working on earthen steps to resemble dirt stairways to the surface rather than having actual stairs/ladders as the original had. 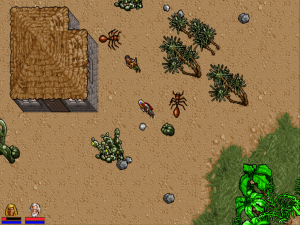 – The ants are still a work in progress, just waiting on some more frames to be completed. – Other sprites in the works are new looks for the gypsies Blaine, Taynith, and Karina the young dancing gypsy, that closely resemble their U6 portraits. – Minoc is complete albiet a few npcs needing usecode work. The map is somewhat complete structurally, all cities and towns are finished in that regard. All shrines are completed with the exception of the Shrine of Spirituality. 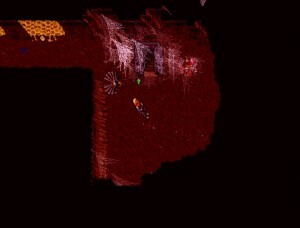 The Cyclops cave, Spider cave, Moonglow crypts, and some other outlying areas are finished or near finished. AgentOrgangeGuy has been doing quite a bit of work lately. Mostly fixing up the NW portion of the map which is almost complete, and usecode stuff. He’s fixed rivers, coastlines, and the other side of “The Long Haul” and fixed the mountains and rivers there. He’s also been working on Minoc NPCs – Juila, the Darkwatch Armory guy, the mayor are now complete with conversations and just need new portraits. Nicodemus is also fully functional. He’s also added a few random things here and there on the map, including an “outpost” outside of Yew that will be explained by a storyline from the new npc that will join your party (not yet created but his conversation file is nearly done). signs, some books, and things like that have also been fixed. Also, the magic yew staff is functional. You are now able to buy the normal yew staves (shape created by Crowley) from Nicodemus and charge them with the Lightning spell. More spells will be added soon. 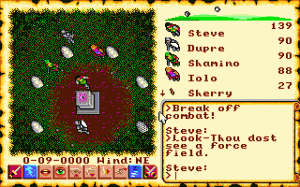 When the charges run out (they hold 10), the staff changes back to a normal Yew staff that can be wielded in combat much like a normal staff. The Avatar death function has been changed to cause you to ressurrect at the Castle. It is near functionally complete, it lacks dialogue from LB/Nystul but it both resurrects the Avatar and any dead party members nearby. 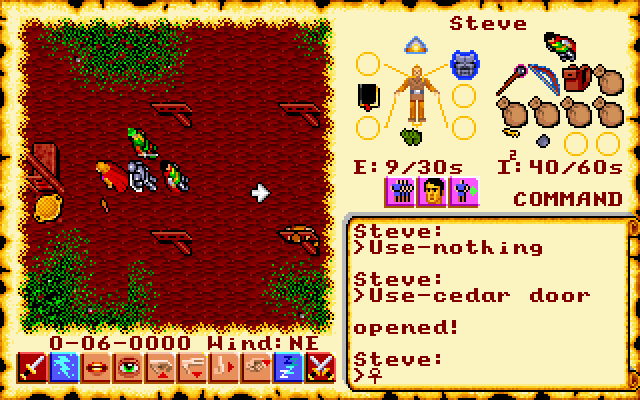 The Yew Staff is in the inventory, both a normal one and a lightning charged one. The code is slightly buggy with it right now but it shouldn’t be too hard for him to fix. 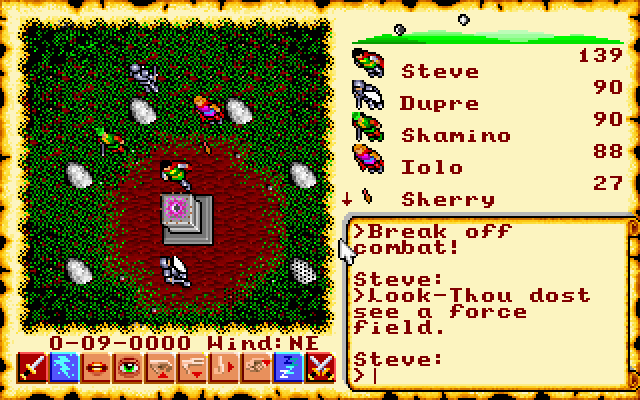 It is supposed to work by double clicking the yew staff, targeting your spellbook, avatar casts the enchant spell and enchants it. Let me know if you are up for some map work sometime. We’re very close to having the NW sector of the map complete or near complete! Doris from Minoc is our first functioning innkeeper. I implemented the ‘now or later’ inn feature where you can do it U6 style or U7 style. The only drawback to U6 style right now is that it doesn’t heal you as of yet. Until I figure out how to do that without doing it manually and very ‘clunky’ (lots of code that isn’t worth it), it just passes time until checkout time (9am next day). The fade and unfade works just fine. The U7 style works but I need to make the egg to where you give the key back or the stuff that happens when your late. 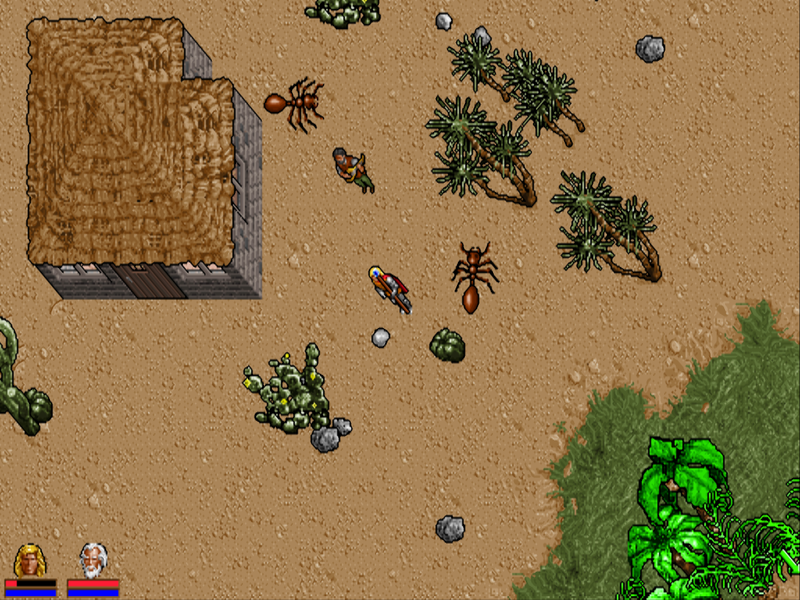 I was playing U6 for SNES last night to play a few areas for comparison to the pc game and get a few ideas. The SNES version is known for a pretty interesting glitch… where the gypsy party goes berserk and will kill you. The first part of this glitch is that the schedules for the gypsies get mixed up after you play maybe a week or two in game. The gypsies seem to “split up” and can be encountered in different areas – Kador along the path to “the Long Haul” – Minoc side, Blaine is usually asleep in the water off the shore from Minoc (??? ), and Zoltan seems to be somewhere between Britain and Skara Brae. This glitch seems to affect Mandrake as well, I once found him wandering in the swamps before the Shrine of Justice. After a while(few days in game), it clears up on its own and the gypsy group “re-assembles” and goes about their normal schedules. Encountering them during the daytime in this state of disarray, nothing happens – they function normally when conversed with. However, it seems that when you encounter these gypsies as night falls, all hell breaks loose. I noticed this glitch a long time ago when I’d wander out of Britain at sundown and along the path, out of nowhere, Zoltan would come running up to me and start attacking! 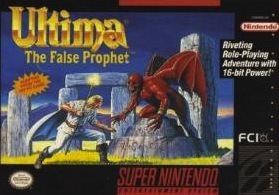 Since the SNES version is very “politically correct”, you cannot kill npcs nor can you attack them. This causes a problem when Zoltan attacks, you cannot pause, you cannot run, you cannot fight back… you are completely at his mercy. Combat music goes on for a split second, Zoltan gets his hit in, the combat music ceases. Rinse and repeat. At this point you pretty much have to reset the game, or let Zoltan kill you (at 4 to 5 hits a pop, that will take a while). So, while playing last night I was flying in the balloon towards the path between two rivers along the way to the Minoc side of “the Long Haul”. I was going to fight the group of bandits that you encounter between the rivers. I landed right before that area and it was night time, and out of nowhere, Kador comes running at me like a rabid dog. Again, nothing I could do. 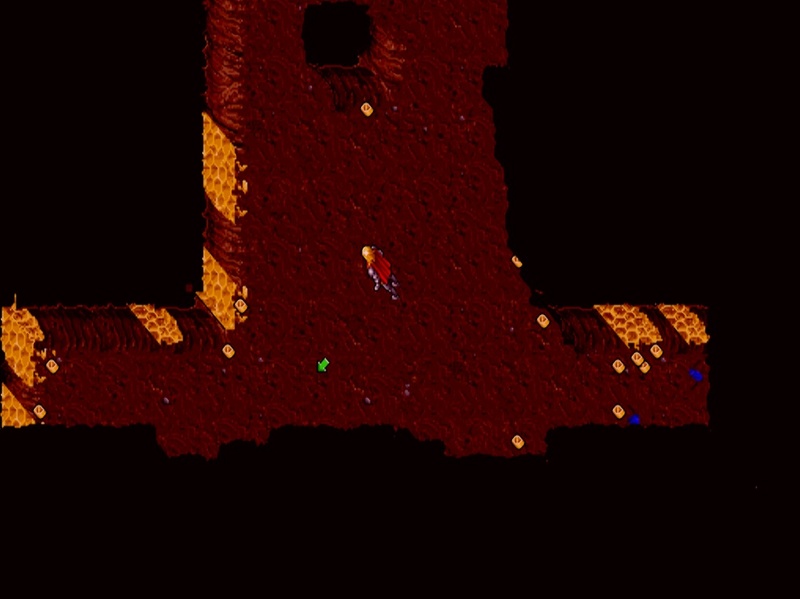 I reset, and did the same things to see if I could repeat the glitch – teleport from Trinsic to Shrine of Compassion, board the balloon, go to the spot. Yep, Kador still attacking. Reset, and this time, I repeated this glitch but landed on the other side of the river. I noticed I could still talk to Kador, and yes, I did pay him for his tricks, just in case he had been trained to attack cheapskates. I lobbed a powder keg that way, but alas, he was immune to it. I reset, then tried to repeat the glitch again, but going the long way by walking. Kador was gone. I believe the gypsies schedules might reset at midnight, but I’m not entirely sure. Crowley has been busy and finished a few custom shapes such as the Yew staff. 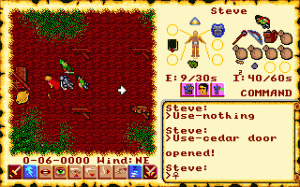 The Yew staff can be equipped and used in combat as a normal staff. He’s finished a few different colours of the Yew staff also that will correspond to what type of spell the staff will be charged with. Sythifuge has been working on a Hydra shape and a grave shape to contribute to the mod. ZygonDragon has been cleaning up the mountains and forests around Britain. Still quiet a bit of map work to go but we’re getting closer to an official release. 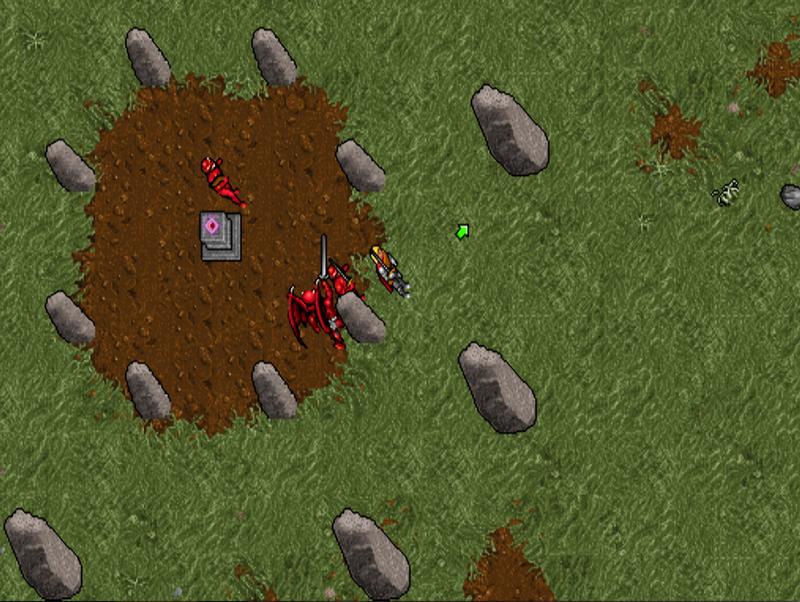 Here are some new screenshots of the Shrine of Compassion and the stocks in Yew. AgentOrgangeGuy stops for no-one. He’s been very busy over christmas and new years and has completed work on all the shrines. The shrine’s can now be restored. 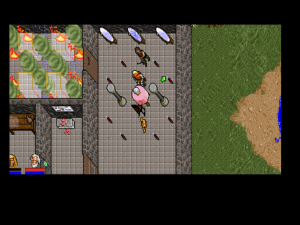 Minoc has also been populated with its NPC and all conversations have been converted. 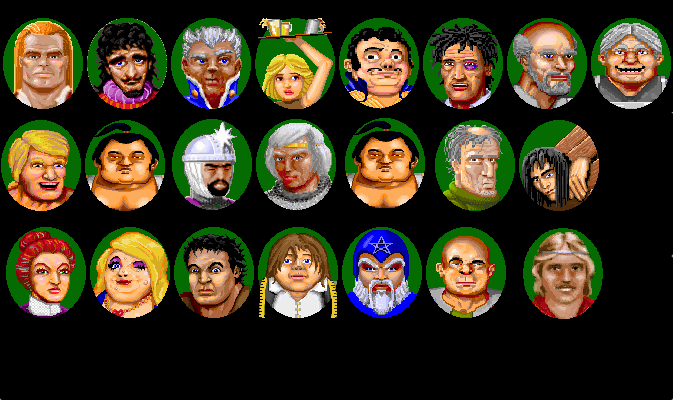 The NPC’s portraits still need to be done but the rest is pretty much complete. Work has started on some of Moonglow’s crypts too. The custom book submission is still open so if you would like your material to appear in the remake send it in. Just keep it relevant to the game. Please email your books to AgentOrangeGuy. AgentOrangeGuy has finished coding the Shrine of Compassion and the Shrine of Valor. 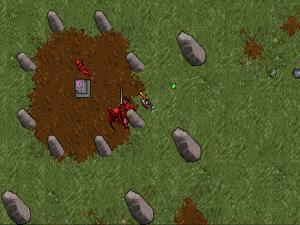 Both shrines are now freeable and the runes can be found. He has also nearly finished Sutek/Blackthorne’s former castle. Crowley has been busy creating some new shapes too. AgentOrganGuy has been hacking and slashing away at the usecode. The part of the rune of valor quest where you enlist Sherry’s help is done. As of right now, it is scripted due to the game locking up when ‘going solo’ with Sherry (Avatar polymorphed into Sherry and vice versa). 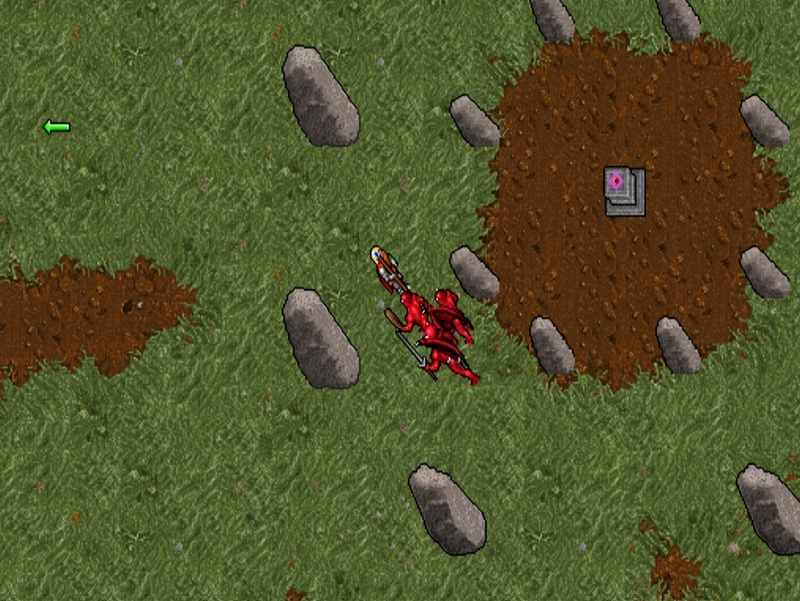 The rune of Valor can be obtained now, and soon the shrine will be able to be freed. All cities and towns are structurally complete, some just need npcs and conversations finished. Right now he’s working on the main points of the plot (being able to get the runes, free the shrines), and cleaning up some areas here and there on the map.